Oldham Boxing and Personal Development Centre | Well done Steve! “My name is Steven Ferguson. I am a 34 year full time single parent to my 2 children aged 5 and 7. In August 2009 I had a big change in my circumstances and I became a full time parent. I was previously a self employed landscape gardener. Due to the circumstances I couldn’t carry on with this work because I needed to give my children the attention they needed. Suddenly I had time on my hands during the day and a change in finances. I had a very low income of only £55 p/w and I now had to claim housing and council tax benefits. I decided I would like a change in career and wanted to go into youth and community work. I could use my time during the day to achieve this. 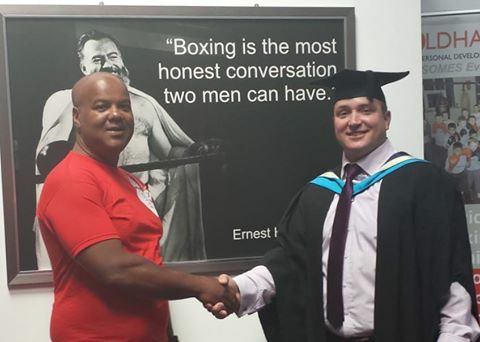 I have always had an interest in keeping fit and healthy and also in boxing and I had previously worked out at OBPDC and met the coaches, Eric, Charlie and Glyn. I knew that courses were regularly held there and I decided to go in and have a chat and get some advice. After a conversation with Eric and some good advice I signed up to do a level 1 in exercise studies and Eric also said he would do my CRB check and let me do some voluntary coaching. I started volunteering for around 10 hours per week. I found this a great experience and learned a lot about working with a wide range of people of different ages and backgrounds which helped me to reflect on my own situation and put it into perspective. It also motivated me. Even though I was going to the centre to coach people in fitness and boxing I also benefited a lot from meeting lots of different people and speaking to them and sharing views and thoughts on different things. I completed the NLDCF funded Exercise Studies course and then went on to do an NLDCF Introduction into computing course. I then completed a NLDCF back to work course that covered areas like, goals, barriers, actions, CV writing, interview skills and more. I then completed a NLDCF personal development course which covered areas in team leadership, working with others and communicating effectively. I have also completed an Introduction to NLDCF Youth Work course and a Reflexology course at the centre, Awareness of Child Abuse and Neglect course and a Sports Leadership level 2 course. I was accepted to do a NVQ level 2 in youth and community work and successful in completion of this has seen me progress to a degree course in Health and Social Studies which I subsequently graduated with a 2.1 last week.. I also continue to coach for Oldham Boxing, and am a keen volunteers as well as having secured sessional employment.